Who doesn’t like buns, especially in a place like Mumbai that survives on these beauties at least one meal a day. Keeping this important fixation in mind, The Bun Bistro, a new eatery in Kandivali, is all set to satiate those taste buds with their 100 per cent vegetarian and freshly baked savoury and dessert roti buns. There are a lot of flavourful options to choose from. If you’re into the sweeter side of life, you can opt for the classic Nutella, dark & white chocolate, orange dark chocolate, cookies & cream, peanut butter and berry, dates, red velvet crumble and cream cheese, the caramel custard or even the white chocolate pistachio. If savoury’s your thing, you can opt for creamy mushroom, herb & cheese burst, soya bolognaise, pav bhaji or even the makhani buns. All of them are priced at an affordable INR 149. They also serve savoury and dessert fries; so you can take your pick from creamy mushroom, pav bhaji, makhani or herb & cheese or opt for the Nutella fries. 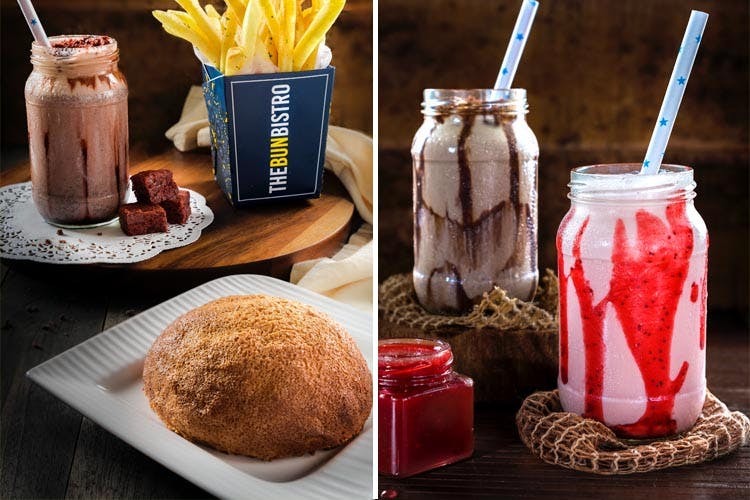 The savoury fries will cost you INR 129 while the dessert fries will cost you INR 139. To help with all the delicious buns, you also have milkshakes in a riot of flavours – Nutella & hazelnut, brownie, chocolate Oreo, alphonso mango, strawberry, cold coffee and even hot chocolate. The beverages range from INR 149 to INR 179 respectively. If you’ve got the crazies for all things sweet and savoury between buns, this is the place for you. Even if you don’t, become a hybrid Mumbaiyya with such succulent options to tempt you. Either way, you’re in for a treat. We’ve been told that there’s a special offer that’s on this Friday only from 11 AM, where you can get any bun at just INR 1. Make the most of it!